Providing you the best range of citrus hand juicer with effective & timely delivery. Application Coffee Shops, Restaurants, Juice Bars, Pubs and Domestic Kitchens. The compact and simple design of the Citrus Hand Juicer coupled with its sturdy performance makes it an ideal choice for both commercial and domestic applications. 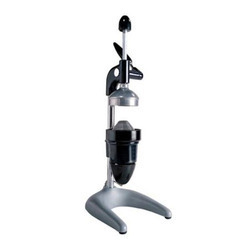 The unique rack-and-pinion gear system for squeezing the juice makes it effortless for the user while it ensures maximum juice extraction from the fruit. Looking for Citrus Hand Juicer ?